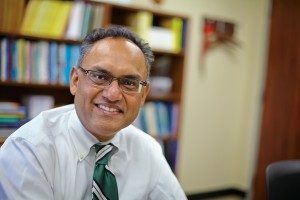 The state of the Eli Broad College of Business is strong, Dean Sanjay Gupta told faculty at a recent faculty kickoff event. But the story of its upcoming 2018–19 school year will depend on how the college continues its evolution to best prepare the students of today for an ever-changing tomorrow. “If you talk to the students, they are unnerved by all of the changes that are taking place around us, and they are taking place at warp speed … we have this opportunity that’s once in a lifetime, to be able to put together an educational experience that is going to make them successful,” Gupta said during the Friday, Aug. 17 event. “This is an exciting opportunity for us, and I hope that all of us are able to commit to providing the best possible student experience and enjoy the rest of this academic year in making this come alive,” he said. The Broad College enters the new school year with its undergraduate program ranked among the nation’s top 15 public business schools by U.S. News and World Report, which also ranked the Broad College’s Supply Chain Management program as best in the country. The Broad College Full-Time MBA program placed among the nation’s top 20 public programs, as chosen by a host of rankings organizations. This year’s undergraduate initiatives at the Broad College will largely revolve around the themes of having a global mindset, ethics and integrity, and a digital economy, as well as trust and inclusion. The annual Roy S. Pung Lecture Series will emphasize ethics in business as its theme, and ethics will be at the heart of a new required course on business law and ethical leadership. The college will also be looking for increased frequencies but shortened durations of education abroad programs for business students. Meanwhile, construction of the college’s $60 million Business Pavilion – which will be home to flexible classrooms promoting collaborative learning, along with other student-centric resources – is on schedule for the building to open for the fall of 2019. Gupta acknowledged that “last year without a doubt was one of the most difficult, most challenging years for this institution in particular. And that permeated throughout the entire campus” in the wake of Larry Nassar’s arrest and convictions. Gupta also noted MSU will be welcoming its biggest ever freshman class, more than 8,400 students strong. Classes for the Fall 2018 semester start Wednesday, Aug. 29.